The new Nissan Qashqai Hatchback is easily one of the best family cars on the market today. It can offer awesome visibility of the road, chunky good looks, and plenty of versatility so that you and your family can travel in style with minimum fuss. The first generation Qashqai sold like hot cakes, which meant that Nissan just had to double down on what had worked so well. And one of the things that it did so well was take what families love about hatchbacks and SUVs – and mix them together. It sounds like automotive alchemy, but it’s worked well so far, with the result being an exciting driving experience in a very robust car. 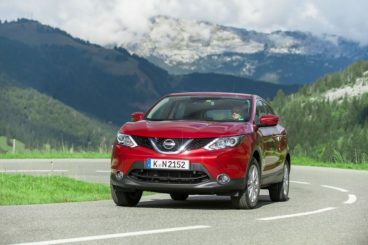 OSV takes a closer look at what it’s all about with our Nissan Qashqai review. Despite its size, the Qashqai is a lot of fun to drive, especially on twisting country lanes. This is largely thanks to a suspension setup that resists body lean, as well as steering which doesn’t respond to every minuscule input. 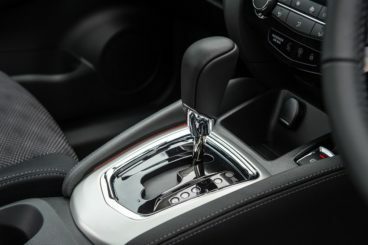 Moreover, the car remains stable and composed when you take on corners, and this is down to a few things, the most notable of which is Active Ride Control. This feature prevents that nasty up-and-down motion that often occurs she you drive over bumps by braking each wheel separately. It’s clever stuff. The suspension ensures good ride quality, even if you opt for the bigger 19” alloys. The raised ride height means you get commanding view of the road, and if you go for the Tekna model, you also benefit from a 360-degree camera. The 1.5-litre diesel engine might not be particularly fast, taking as it does 12.4 seconds to cover the 0-62mph dash, but it packs plenty of punch and makes for a solid enough cruiser on the motorway. It’s actually our top pick, and is ideally suited for a family car such as this. The bigger 1.6-litre diesel will cost more to run, but it’s significantly quicker than the base-level engine. Unlike the 1.5, it comes with four-wheel-drive, as well as the Xtronic automatic transmission. There are a couple of petrol engines to choose from, too. A 1.6-litre DIG-T petrol power plant suits the Qashqai Hatchback’s urban nature, and can get you from rest to 62mph in 9.1 seconds before maxing out at 124mph. It’s quiet and refined and is the cheapest engine to run. Put it in the wrong gear, though, and it will feel sluggish. The 1.2-litre petrol engine, meanwhile, is considerably more lacklustre, and takes 11.3 seconds to cover the 0-62mph sprint. The cabin is refined, well-built and can boast a good amount of equipment. 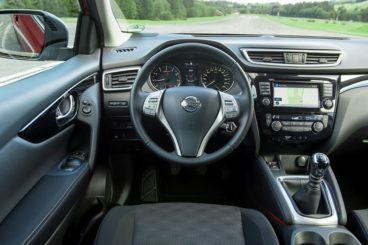 The dash feels like it was made to last, and Nissan certainly hasn’t been stingy with their use of soft-touch plastics. They are everywhere. Fortunately, buttons are not everywhere, with Nissan going for a clean and tidy aesthetic. The buttons that are here are easy to find and use, while the intuitive infotainment system is a highlight. The seats are supportive and comfortable, and you get to choose from a number of different cloth trims. The driver’s seat is height-adjustable, but the steering wheel can also be adjusted in and out. External noises are kept to a bare minimum, with only the faintest traces of wind sounds making their way into an otherwise-whisper quiet cabin. Until your kids start to sing, of course. Sporting almost identical dimensions as the Ford Focus Hatchback means the Nissan Qashqai is not only a very likeable car, it’s also a very usable car. It’s taller than the Focus, which means you get more headroom as well as a better view of the road. But this increased height and more expansive view might be intimidating to some of you. However, it does make the car easy to park. Head, leg and shoulder room is good up front, but rear headroom is compromised by a panoramic glass roof. At the same time, though, this roof increases the overall sense of space. It also makes the cabin airier. The boot measures a respectable 430-litres, and because there is no boot lip, sliding in heavier items is a piece of cake. The boot comes with a useful false floor, while all models get a tyre inflation kit. Standard equipment is decent, but if you opt for the entry-level model you’ll miss out on alloys. However, you will get the aforementioned Active Trace Control system, as well as a colour screen in your dashboard and air conditioning. Move up to the Acenta trim and you’ll benefit from climate control air con, lashings of leather trim, and power folding door mirrors. The range-topping Tekna trim adds 19” alloys, satin silver roof rails, and more leather. Prices for the new car start out from £18,500 and rise to just shy of £29,000. If you want to lease the car, you can pick up a deal from as little as £160 + VAT per month. Despite being a large family car that has SUV aspirations, it’s surprisingly frugal – although not as frugal as more conventional hatchbacks, such as the Ford Focus. The 1.5-litre diesel engine is the cheapest engine to run, achieving fuel economy of 74.3mpg while costing nothing to tax. It’s a solid engine that, despite being entry-level, offers more than enough power to turn this Qashqai into a relaxing cruiser. The 1.6-litre diesel has more of a punch, and averages fuel economy returns of 64.2mpg. The cheapest petrol engine is the 1.2-litre unit that can return 50.4mpg. In terms of resale values, the car should hold onto 45% of its original price after 3 years. Previously, you had the option of a seven-seater Qashqai. But while only a five-seater verso remains, it doesn’t mean there is less practicality. In fact, there is more. The new Qashqai has more interior and luggage space than last time around, no doubt helped by the fact that there are fewer seats. Jerkiness has been reduced by the brand’s Active Engine Brake function, while Body Motion Control technology smooths out anybody movement as you tackle bumps. Overall, the ride quality is very good. The car is impressively economical, with the entry-level diesel capable of returning 74.3mpg. The petrols fare well too, with a performative 1.6-litre turbo good for 50.4mpg. There is more space upfront and in the back this time around, but rear legroom is still a tad cramped. On longer journeys, taller adults will feel the pinch. 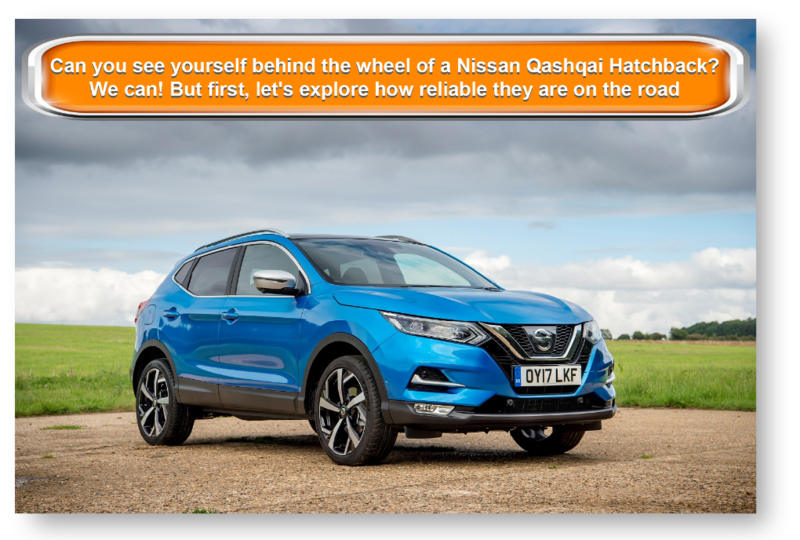 If reliability is a major priority of yours, question marks over Qashqai’s dependability might leave you considering your options. In 2015, it came 46th out of 200 cars in CarBuyer’s Drive Power customer satisfaction survey. Owners said they were happy with many aspects of the car, but raised concerns over its reliability. Let’s see how the car fares against its rivals in the comparison section of our Nissan Qashqai Hatchback review. The new Ford Focus Estate is an efficient family car that is fun to drive and can boast an excellent range of engines. Ford’s are generally the best cars to drive in any class they occupy, and this is the case here. The Focus Estate might be bigger than the standard hatchback, but direct steering, responsive engines and nicely judged suspension all combine to ensure a lot of fun when you’re out on the road. The diesel range is made up of a trio of engines, starting with a cheap 1.6-litre TDCi unit that is beginning to show its age. You can get it in either 94 or 118bhp power output, but we recommend overlooking the former. A 1.6-litre unit is also available in two power outputs, while a bigger 2.0-litre TDCi diesel is only available with more expensive trims. The petrol engines are relatively small, but their economy is given a boost by the introduction of turbochargers. As a result, the 1.0-litre EcoBoost petrol engine can achieve fuel economy returns of 58.8mpg. If running costs are one of your main priorities, the 1.5-litre TDCi diesel engine is the cheapest in the range, averaging returns of 74.3mpg. The interior is roomy and comfortable, and a modern-looking dash serves to bring the cabin up-to-date. The seats offer lots of adjustment, while not too much road and wind noise seeps in. 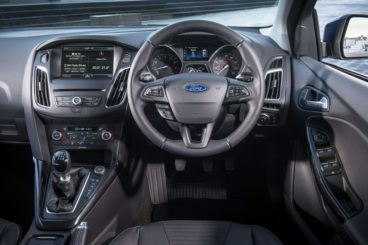 Fit and finish is not amazing, but Ford has done a good job of cleaning up the dashboard, which was just far too cluttered last time around. Build quality is good, but the Nissan looks like it’s built to last longer. The Ford Focus Estate doesn’t major on practicality, but it doesn’t fare too badly. Space is good up front, while a few cubby holes here and there should help to keep the cabin nice and tidy. However, it’s lacking a new intelligent practical touches, such as underfloor storage, that would have made it more attractive. It boot, meanwhile, measures 476-litres. 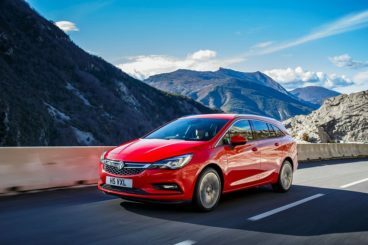 The new Vauxhall Astra Sports Tourer takes everything that made the Astra hatchback so appealing and adds more size and practicality. Although bigger than the hatch, the Vauxhall Astra Sports Tourer remains an entertaining car to drive. It isn’t unwieldily by any means, and manages to blend comfort with a bit of fun. It resist body lean in bends well, and offers a lot of grip. The petrol range is stuffed with choice, starting with a 1.4-litre 99bp four-pot unit, which is followed by 1.0-litre 104bhp turbocharged engine. We recommend that you overlook the former, as it’s old and doesn’t have enough power to do this car justice. The 104bhp turbocharged engine isn’t especially quick, taking 11.0 seconds to cover the 0-62mph sprint, and it can struggle under too much weight. As such, the best petrol engine available is a turbocharged 1.6-litre four-pot unit power plant that delivers 197bhp. The diesels offer a bit more might, and performance is reasonable whichever you select. 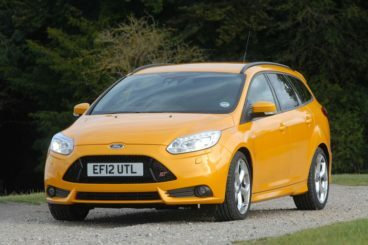 They will also be the cheapest to run, with the 1.6-litre 108bhp diesel able to achieve fuel economy returns of 83mph. These numbers are impressive, and they’re helped by stop-start technology. The cheapest petrol engine to run, conversely, is good for 67mpg – which is very impressive. Last time around, the Vauxhall Astra Sport Tourer’s interior really let it down. Not so now. Everything feels a lot more upmarket, and it can rival the Qashqai when it comes to design and overall fit and finish. The driving position is good, the seats are adjustable and comfortable, and the dash looks more and robust. The Intellilink infotainment system is easy to get used to, and the cabin looks overall clean and well appointed. 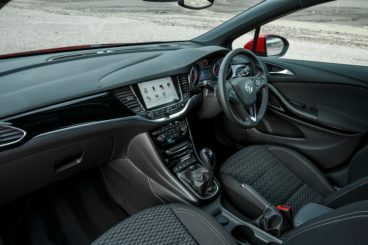 There is a lot of interior space in the Vauxhall, both up front and in the back. Access is easy thanks to wide opening doors, while the boot measures 540-litres. Although this is a bit of a confused hatchback that think it’s an SUV, it isn’t a problem – it just means it can offer the best of both worlds while going head to head with some solid but bland-looking family estate cars. Killer looks, versatility and robustness are a recipe for success, and the new Nissan Qashqai promises to be the quintessential family car that is perfect for the school run, motorway commutes to work, and family weekend breaks. Looking For A Price For The Nissan Qashqai Hatchback?